For years, our customers have asked, "Aren't there ANY stainless propane refrigerator available?" with stainless steel doors are now available. These 18 cu.ft. capacity refrigerators have a black textured finish with brushed satin-finish stainless steel doors on the cabinet. Features include a battery-operated interior light and a remote wireless digital thermometer. Specify left or right-hand hinge (must specify upon ordering). Includes the regular Crystal Cold 18 cu. ft. features. $2299 plus freight. NOTE: Appliances are not stocked locally and ship from our suppliers located back east. Capacity: 18 cu. ft . Conversion to natural gas is an additional $50 charge. The 19 cu.ft. capacity refrigerator/freezers are available in white, bisque, black, or stainless steel with black textured finish and brushed satin-finish stainless steel doors on the cabinet. Features include a battery-operated interior light and a remote wireless digital thermometer. Specify left- or right-hand hinge (must specify upon ordering) on the stainless steel models only. Please see the specs on the 19 cu. ft. units listed below: White/Bisque/Black: $2294 plus freight; Stainless Steel: $2350 plus freight. Capacity: 19 cu. ft . These 21 cu.ft. capacity refrigerator/freezers are available in white, bisque, black, or stainless steel with black textured finish and brushed satin-finish stainless steel doors on the cabinet. Features include a battery-operated interior light and a remote wireless digital thermometer. Specify left- or right-hand hinge (must specify upon ordering) on the stainless steel models only. Please see the specs on the 21 cu. 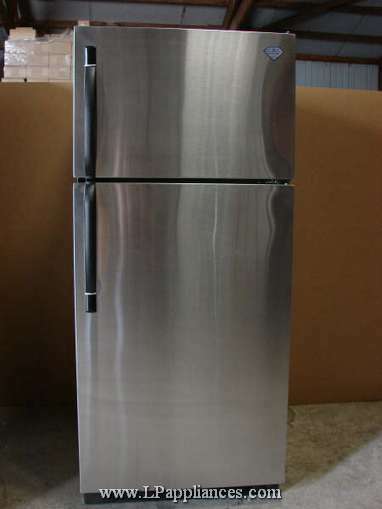 ft. units listed below: White/Bisque/Black: $2399 plus freight; Stainless Steel: $2450 plus freight. Call us at (406) 777-4309 or email to order yours now! WHAT TRUCK FREIGHT ENTAILS: The best rate for truck freight shipping is to have you pick it up at the local freight terminal or commercial drop point. A residential delivery is usually $50 to $60 more than a business delivery, and, a lift gate (which drops the goods off at ground level), is another $80 to $100 in additional fees. Inside delivery is an additional cost on top of that. Know someone with a truck? Can you have a dolly or hand cart on hand? If you can mobilize a couple of strong bodies, you might be able to save $50 to as much as $120 or so on your freight costs. NOTE ABOUT RECEIVING TRUCK FREIGHT ITEMS: Do not sign for anything until you have inspected your unit. You have spent good money on this, and it was shipped in good condition. If you don't inspect it, and open the unit at home and find 'hidden damage', there is no recourse for a truck freight claim. All claims for damage MUST be made at the time of receipt of the unit! Note any damage on the bill of lading before signing off--it's a relatively easy process to get a new unit or replacement parts if you do so. But not if you don't inspect it! Also, don't refuse an obviously damaged unit. You will still be charged for it, as we will also be by our suppliers. Freight damage is very rare (FORTUNATELY! ), but proper documentation and reporting of any damage will expedite the claims process.